Degree One Events: DL Incognito.... Live at Lucky Bar. DL Incognito.... Live at Lucky Bar. Politic Live & The Scale Breakers (Subway & Guy Woods). 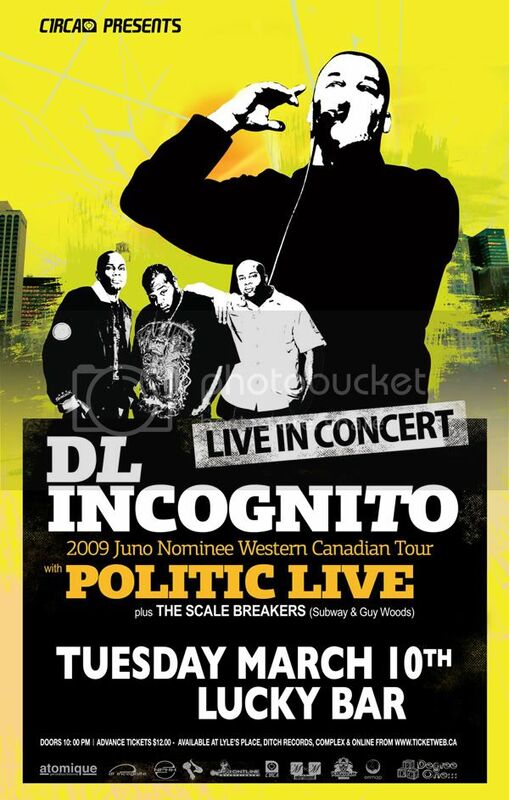 Just announced - DL INCOGNITO has been nominated for the Upcoming 2009 JUNO AWARDS...! Spreading like a wild fire in the underground, DL Incognito is like a retrospective of hip-hop. Praised by fans and peers alike for keeping that "90's" sound alive, DL's one of the few new school emcee's that keeps it authentic in every sense of the word. Combining old school sampling techniques with new school rhymes, this producer/emcee has crafted a sound enjoyed by many avid hip-hop fans all over the world. »» His 2002 debut album "A Sample And a Drum Machine" was just a preview of what's to come. Having firmly planted both feet in the music industry with 2 full-length albums plus 2 powerful videos playing on all the major video networks in Canada; DL Incognito, backed by producer Techtwelve as well as Mic Check, has excelled with talent and not payola. When DL Incognito’s first record came out in 2002, he was proclaimed as Canada’s best kept urban secret, a newcomer breathing life into a semi-comatose hip hop scene. The album, called A Sample and a Drum Machine, dug deep into the crates to bring the authenticity of old school hip-hop back to the forefront. In 2006 DL Incognito followed up quickly with his third full length recording titled “Organic Music For A Digital World.” The album was also nominated for a Juno in the Best Rap Recording category. DL Incognito’s fourth album, A Captured Moment In Time, was released to rave reviews in 2008 on URBNET Records.